KUMHO Tire USA has agreed to supply tires for Mazda North America’s team, B-K Motorsports, in the American Le Mans Series. The B-K Motorsports Courage C65 Mazda will race on KUMHO tires for the first time at the Lone Star Grand Prix in Houston on May 11 and 12. “We will continue to supply tires to Miracle for endurance events, but we wanted to find another team with which we could contest the full ALMS season,” said KUMHO motorsports manager Rudy Consolacion. Miracle Motorsports’ John Macaluso recently decided to concentrate on Le Mans and Petit Le Mans this year. Guy Cosmo and Jamie Bach won ALMS rookie of the year honours in 2005, and they stay with the team for this year. The highly respected Marcus Haselgrove is B-K’s newly appointed technical director and team manager for 2006. 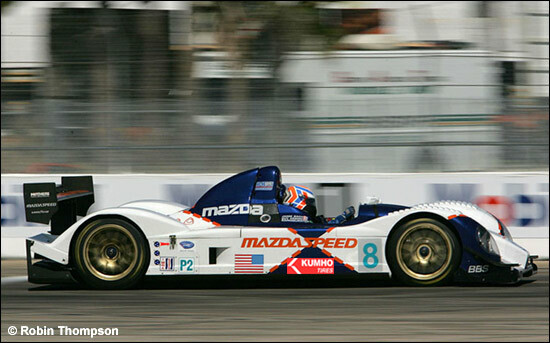 “LMP2 is a very competitive class with teams such as Intersport Racing and the Roger Penske-prepared Porsches. Acura is coming into the class next year, so LMP2 will be a great proving ground for Mazda and KUMHO,” summed up Rudy Consolacion.